Recently, I came across an article about what seems to be a significant development in the commercial trade exchange industry. Published on February 15, 2018, the article, TradeAuthority rebrands as Moxey with new digital currency, national expansion plans, tells about the expansion and rebranding of a commercial trade exchange heretofore known as TradeAuthority. Operating for the past several years in the Gulf Coast region of the southern United States, TradeAuthority has developed along lines somewhat different from most other trade exchange companies. I’ve had some peripheral knowledge of TradeAuthority for a long time but after reading the article I decided it was time for me to reach out to its founder, Chip Davis, with the intention of gaining a more detailed picture of how they operate and their plans for further development and expansion. The company, now named Moxey, is a network of 14 autonomous member-owned local trade exchanges, member ownership being a unique feature in the commercial trade exchange industry. The key players in the Moxey enterprise are Chip Davis, founder of TradeAuthority and current Executive Vice President of Moxey, Charlie Davis, President of Moxey, and Warren Sager, Moxey Vice President of Operations. What degree of autonomy do the various (14) exchanges in your network have? Is it possible for a member in one exchange to buy/sell directly with a member of another exchange in the network? Does your platform provide that functionality or does the trade need to be pre-arranged with brokers in the two exchanges? Is there a single Moxey ledger for the entire network or does each exchange have its own? If the latter, how are accounts reconciled among the exchanges, and how often? What are the factors you use to allocate lines of credit? How are they weighted? Are all exchanges in the network required to apply the same algorithm in allocating credit lines to their members? You say, “Moxey intends to be a better Medium of Exchange by removing the concern of inflation.” How does it do that? Is you online portal a complete marketplace that includes offers and requests? Vendor and client background? Reputation ratings? When using the app or online portal, is approval of the transaction immediate? You also say, “It also removes the extreme deflationary dangers that can exist in a purer form of money such as gold.” Can you explain that? What additional functionality will be achieved by using blockchain? “The major thing behind all currencies is a trust and transparency in knowing the currency is strong and blockchain technology will allow an additional level of transparency,” says Warren Sager, Moxey vice president of operations. “It will allow our currency to become stronger and more trustworthy.” But that does not address the transparency of the credit allocation process. Please comment. The trade exchange industry seems to have been for some time on a plateau or slow growth trajectory. How do you see moneyless trading alternatives evolving over the next few years, and how much of an increase in scale do you anticipate? You can read Chip’s and Charlie’s answers, and our full conversation by clicking here. –t.h.g. That is well and good, but it misses the main point of what ails our communities, and our world. 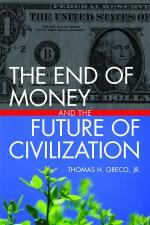 It is the very nature of the dominant political money system that is problematic. So, localization is not the end in itself, but the necessary means to an end, which is personal re-empowerment and freedom; community resilience, sustainability, and self-determination; and the revitalization of democratic governance. Community currencies and exchange systems provide an essential tool kit for achieving those goals but they need to be designed in such a way as to make people less dependent upon political money and banks. So long as we remain harnessed to the dominant money and banking regime, there will be little chance of significant improvement in the human condition, in fact, the trend has been exactly opposite. …. Read the full article or download the full PDF. Following last summer’s exciting and successful workshop in Greece, Thomas Greco will again this summer be conducting a workshop in Monetary and Financial Innovation for the New Economy at the Alexandros campus of the Kalikalos Holistic Summer School on the beautiful Pelion peninsula in Greece. In this week-long workshop we will examine the problems and deficiencies of both conventional money and local currencies and exchange systems, and delve into the principles and practices of innovative exchange and finance. Over the past three decades, a great many complementary currencies and exchange schemes have sprung up, gained some degree of acceptance and notoriety, then faded away. This workshop will focus in on the reasons why none of them has become a significant factor in their community economies, and uncover the principles of design and implementation that need to be applied to make exchange alternatives more effective, robust, and scalable. It will also cover new ways of providing entrepreneurs with the resources needed to bring their ideas to fruition and achieve success in the marketplace. This course is designed especially for social entrepreneurs, government officials, enthusiastic agents of change, and serious students who are ready to co-create a new sustainable and convivial economy from the bottom up. In this highly participatory workshop, we will use a combination of presentations, discussion groups (some on the beach), videos, and simulation games, to dive deeply into the process of exploring and developing innovative methods of finance, exchange, and value measurement. Participants will have the opportunity to showcase their projects and ideas and receive feedback from the group. Here is an opportunity to work with one of the world’s leading experts in innovative economics, finance, and exchange, and to collaborate with like-minded peers to create a new economy that works for everyone, while enjoying a delightful summer holiday on the magical Pelion peninsula. Come join us in a process of inquiry, discovery, sharing and collaboration. The workshop will run from 16 to 23 June, 2017. Space is limited so register early at http://www.kalikalos.com/community/x/exchange-finance-new-economy-thomas-greco/. All the perplexities, confusions and distresses in America arise not from defects in the Constitution or Confederation, not from want of honor or virtue, as much as from downright ignorance of the nature of coin, credit and circulation. –John Adams, second president of the United States. During my October tour, I gave three presentations in Kuala Lumpur, Malaysia and another in Sardinia, Italy. Two of the Malaysia presentations were at the International Forum on Inclusive Wealth, but I do not yet have recordings of those. The third was an extended presentation and discussion (on October 10) at the Institute of Advanced Islamic Studies titled, A World Without Money and Interest: A pathway toward social justice and economic equity. Here below is the video of the proceedings, or you can watch it on YouTube at https://youtu.be/8BejigzDAVY. The audio only is here, and the slides that were used in that talk can be viewed here.